There was a time when marble floors were only seen in fine public buildings or high-end homes. As the demand for this durable material has grown, companies like Nalboor Tiles have found better ways to mine, manufacture, and transport the products. You can now purchase marble products directly from us, and that allows you to use these elegant materials in your own build. As you plan your renovation, consider using marble in some of these creative ways. You need a central focal point in any larger room, but you don’t have to go with a plush rug that requires additional maintenance. One of the two options is to install beautiful medallions in the center of a room. Use marble throughout the space, and then have it finished off with an elegant focal point that will last for an eternity. This is a grand design element for the foyer, dining room, and even a large master bath. 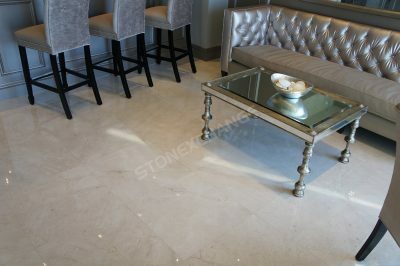 Use Crema River marble for all types of living spaces. This beige and light tan marble has gentle shades that work well with all types of decorating styles. The minor veins add subtle movement to the tile, and that makes it appropriate for formal and more casual areas. This type of tile is commonly seen in kitchens, hallways, and bathrooms. The casual feel makes it perfect for bedrooms, as well. You can pair it with high-end contrasting materials for a more modern, formal look, or you can stick with your casual colors and finishes to maintain the more relaxed feel. Earth tones continue to be in demand, and marble is sure to satisfy you with its delicate shading and impressive colors. Nalboor Tiles carries an impressive selection of Adalia Capuccino tiles that can be used in all types of settings. If you want a lighter shade with a truly unique feel, then go with Breccia Oniciata Marble. This unique coloration includes shades of hazel, salmon, and light brown, and it has a flowing movement that’s pleasing to the eye. You may have looked at this marble before but found that it wouldn’t fit in your overall budget. However, you can shave a good deal of money off the price by going with a wholesaler. Here at Nalboor Tiles, we strive to make luxurious marble tiles more affordable for the average homeowner. We offer bulk discounts along with convenient shipping options, so you may be able to replace your existing flooring with this elegant and timeless marble. Marble isn’t just for the horizontal surfaces in your home. You can also use our marble tiles as your shower walls, baseboards, and kitchen backsplashes. You can also use the marble tiles as a border around your plush carpeted areas or in conjunction with wood floors. Get creative with your designs, and let Nalboor Tiles help you with the natural stone materials. High traffic areas like stairs are perfectly suited to marble because this material is durable and easy to clean. Use marble tiles on the risers and treads of your stairs to automatically give the home an upscale look that you’re sure to love. Contractors save on our products because they’re able to order in bulk. As a homeowner, you can also take advantage of bulk pricing to transform your home for less. If you own property in a subdivision, then you may have several neighbors who are also ready to update their living rooms, transform the patio, or add something special to the foyer. Talk to your friends about going in together on a large order. Our beautiful marble options are versatile enough to be used in a range of different applications, so you can combine orders with friends and keep the overall cost down. You may also be able to pair up with family members or close friends to place one large order for Bianco Dolomiti tiles or high-end Staturio Venatino Marble. You can also use marble to get back to basics while giving your home a more elegant feel. Harlequin patterns are a fun, timeless choice, or you can go with monochromatic finishes to make a small area feel larger. Add borders to make cavernous areas feel a little cozier, and make transitions in your flooring to define key areas of any room. Borders are particularly effective for adding outlines and visual interest to powder rooms and entryways. We’re committed to customer service and satisfaction, so we make it easy to place an order. Just visit our site online to look at the different options and choose the one that’s right for you. Follow the links to place your order remotely and we’ll get everything packaged and shipped for you. If you have questions or would prefer to speak with one of our specialists before moving forward with your order, then give us a call. We’re open Monday – Friday, 9am – 5pm, for special orders and other questions. However, our website is available 24 hours a day. You can call us during regular business hours at 305-501-4548. If you’re ready to update your home, then see how Nalboor Tiles can make the process affordable and fun. We’ll provide you with the high-end, luxurious materials that you need to create a stunning living space that will make you proud.